purple TRD dated 3 M B/6 APR 1900 on pair Natal QV ½d (SG.97) piece. (16 bar) on vertical pair V.R.I. 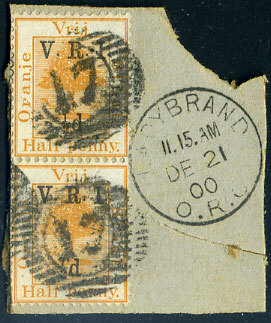 ovp'd ½d on ½d orange (SG.112) piece dated LADYBRAND DE 21 00 cds. 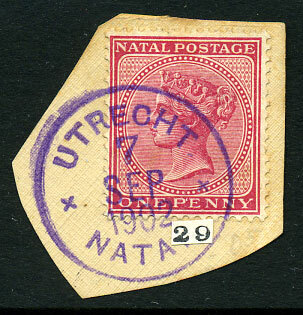 in purple ink part dated -- JAN 1901 on Transvaal 1d V.R.I. (SG.227). (D/R) A/MY 30 02 on Transvaal KE7 ½d (SG.244). (SG.Z6) dated I/JU 28 01 on horiz. 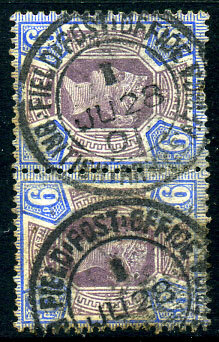 pair GB QV 9d dull purple & blue, reverse toning. dated 8/MR 26 00 on QV 1/- (SG.108). (Hart M.M.1.11) ib blue ink dated 12 Maart 1900 on Transvaal 1d (SG.217) piece. 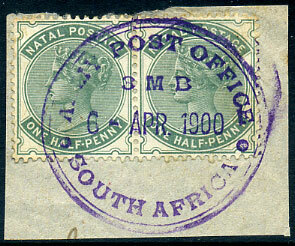 (M.M.1.11) in blue dated 8 Jan 1900 on Transvaal ½d green (SG.216), some toning. 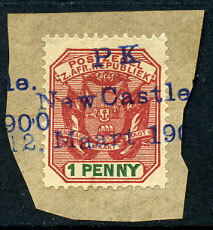 (M.1 or M.2) Boer War period dated A/DE 13 99 on Transvaal 2½d (SG.219). 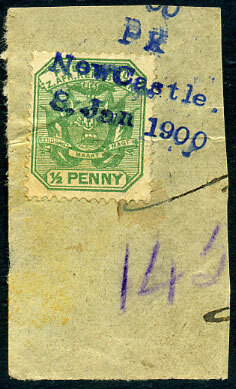 purple temporary rubber datestamp (TRD) dated 7 SEP 1902 on QV 1d (SG.99).